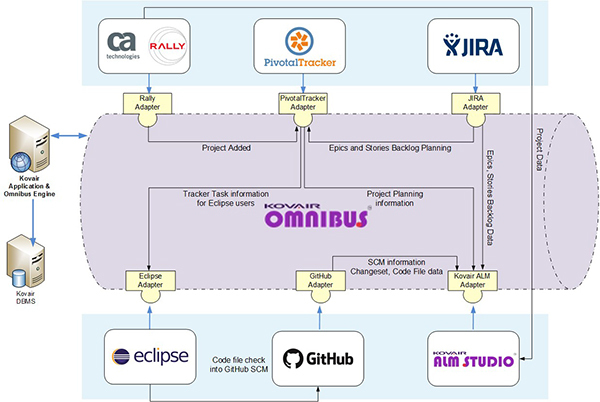 Kovair Omnibus integration is an amazingly powerful platform that enables teams to expedite automation across multiple tools and remove information silos. It allows multiple best-of-the-breed tools to coexist in the development process without any problem or efficiency loss. Older data can also be migrated to Pivotal Tracker to ensure Pivotal Tracker introduction in a development environment has complete information right from the start. Best of all this, integration is simple to set up and enhance. It helps any organization or team transition from any tool to Tracker and set an integrated lifecycle with ease and minimal setup time. Ease of setup: Integration is a simple three-step configuration by using Kovair’s Omnibus web-based UI without writing a single line of code. Monitoring and acknowledgement systems: The entire integration can be monitored from the Kovair application UI itself. Holistic reports outline the total rate of success or failure in sync all in one place. More than just a means of integration: Kovair empowers users to do more by syncing relationship links associated with the objects to achieve complete end-to-end traceability. We enable cross-team/cross-phase, multitool, automated workflows that are presently siloed. Integrate every part of Tracker: All the Pivotal Tracker artifacts can be integrated with other tools for seamless synchronization of data, including all custom work item types, fields, and lookup values. Adapt with the changing processes and needs: The ESB approach to integration makes it easy to adapt with virtually zero downtime in case there is a version upgrade or even a requirement for a new tool to be integrated with Tracker. All a user needs is to install the Kovair adapter for the new version and execute the three-step setup to get the integration running. Sync and link with Kovair’s plugin for IDE: Kovair’s plugin for different IDEs help developers to see the associated information from other tools, modify if required, and update status as the task progresses. Kovair is working with a vision to help Pivotal tracker users to seamlessly integrate with other tools and is providing this solution as an option to use it over the cloud, as a SaaS solution, or install on premise with an easy-to-afford startup price. Connect with sales@kovair.com for more details.